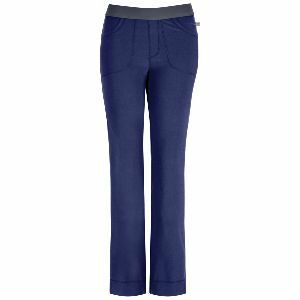 A low-rise, slim pant features a soft elastic waistband, front curved pockets and a mock fly. Also featured is a back yoke in stretch rib knit for added comfort, two back pockets and side vents. Cover-stitch detail throughout. Inseam length: 34"